includes a valid Python comment but it is not a valid todo comment because of the python code in front of it. 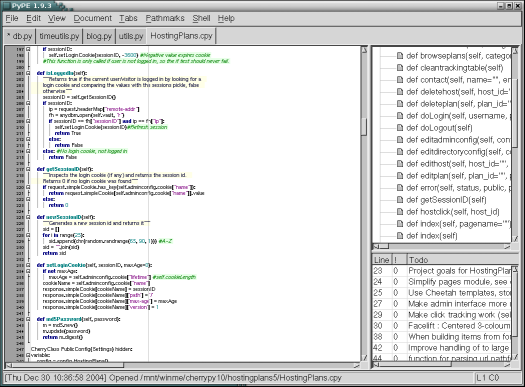 The PyPe view consists of a text area where you write your Python code, a browsable code tree to the upper right and a box with shortcuts to your todo comments to the lower right. Whenever you think about something that needs to be done or find a problem with your Python code that you can’t fix instantly, add a todo comment and PyPe adds it to your todo list. 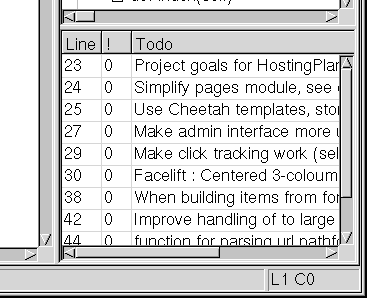 The todo list is built when you open your file and refreshed everytime you press F5 (note: you might have to enable todo comments in the document menu). You can add todo comments anywhere in your code and when you doubleclick an entry in the todo list you are taken to the line that contains the todo comment. Simple, effective and brilliant! This entry was posted on Thursday, December 30th, 2004 at 12:19 pm	and is filed under Editors, General, Python. You can follow any responses to this entry through the RSS 2.0 feed. Both comments and pings are currently closed.